Set in World War Two, this is a stand off between a US war ship and a German submarine when they encounter each other somewhere in the Atlantic. What’s great about this film is that it’s not the usual tale of American heroics typical of many war films, shunning a rigid “good versus evil” pantomime in favour of a far more humanitarian feel. Many war films made in the US feel like watching The Battleship Potemkin, but even more dangerous as they are presented as entertainment rather than propaganda. The Enemy Below devotes almost as much time to the Germans under the sea as the Americans above it, showing the human side of both. A Nazi officer confides to his friend that he sees the war as pointless, and fears that the increased use of technology risks dehumanising conflict, something which is all the more resonant today. Meanwhile Americans joke about how their ship has to be the quietest in the fleet, with some craving some action just for something to do. The boredom of war is shown here as well as the violence, with both sides at various points attempting to win by attrition, resulting in sitting around reading and playing chess. The similarity shown in the behaviour of the opposing sides emphasises how this was a war of governments not people. The armies are made of ordinary civilians called up from their normal lives with little concern for the global conflict they are involved in. 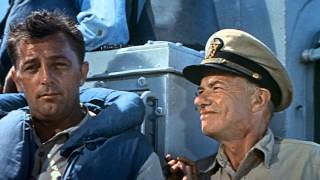 “I’m just doing what I have to, like that German captain out there” US Captain Murrell (Robert Mitchum) ponders. It benefits enormously from having believable, flawed characters. But on top of all this it’s also fantastically made. No expense was spared on the huge sea explosions, even if I was slightly worried about the sea life. There’s some impressive cinematography with sweeping shots of the sailing ship and it’s a rigorous look at submarine warfare. It almost feels like a game of Battleships, with the manoeuvres and counter manoeuvres, often in the dark as to their opponent’s location. Although oddly it’s nothing like the movie Battleships. Not least because there are no aliens or women in it. The German’s speak English with a German accent, which is something I criticised in K-19 but here it’s done far better, with excellent German accents. Add to this that subtitling technology was probably far worse when this was made in 1957 and it can definitely be forgiven. Easily the best of the films I’ve reviewed for this series, The Enemy Below is well worth locating.